While compact pickups had fallen out of favor for a while, a surge of new products — which began with the reintroduction of the Honda Ridgeline for 2017 — is greatly expanding the class. Just hitting the market now is the new 2019 Ford Ranger, the revival of a nameplate last seen for 2011. Beyond that it’s largely speculation, but recent concepts shown by Volkswagen and Hyundai weren’t likely done just for the fun of it, and even Mercedes-Benz is rumored to be looking into the prospect. And if “greatly expanding” seems like hyperbole when we’re really only talking about two sure-fire additions, consider that the class in 2016 numbered just four — and two were essentially twins. 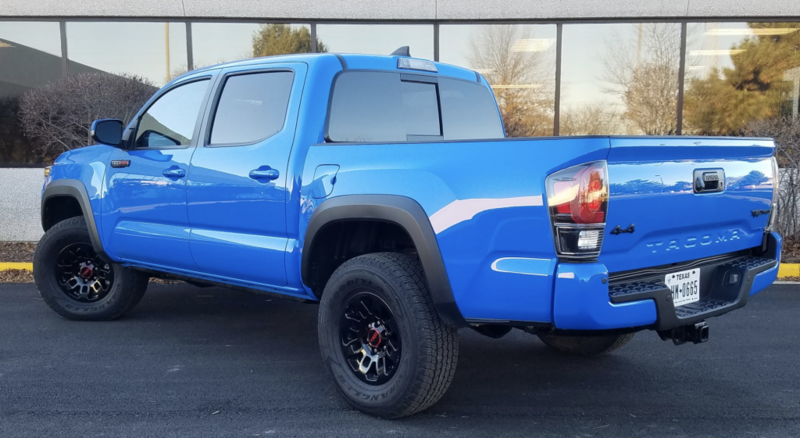 With its raised ride height, VooDoo Blue paint, and black accents, our test Tacoma attracted lots of positive comments. The sliding power back window is a handy touch. The longest-running nameplate in the class is that of the Toyota Tacoma, introduced for 1995, and it has led the segment in sales for many of the years since. This latest edition was introduced for 2016, though that was really more of a “refresh” than a full redesign. For 2019, the Tacoma starts at $26,595 including destination for a 2WD SR extended cab (there are no more compact regular cabs — from any maker), but the tested TRD Pro starts out at $46,365. But for that you get a nicely equipped truck with great off-road chops and decent on-road behavior. There’s precious little padding inside and the look is austere at best, but the Tacoma offers decent cargo space and a handy control layout. What you don’t get, however, is anything fancy. Oh, the exterior drew attention from onlookers young and old (credit the VooDoo Blue paint, which certainly attracts the eye), but climb inside, and it’s mostly industrial grade. Hard plastic dominates, and the driver seat isn’t even adjustable for height — though that’s more of a concern for the very tall than for the average, as is the lack of stretch-out legroom. Legroom is also precious in the back of this crew cab, as my 5’9 frame just barely fit behind my front-seat setting, and didn’t fit at all behind a front seat moved all the way rearward. And though the large rear door opening makes getting through it a breeze, a tall step-in height makes getting in and out a challenge. Elements that make the TRD Pro a TRD Pro include (left to right) monogrammed front skid plate, raised suspension with special off-road hardware, and a prominent hood scoop that makes its presence known from the driver seat. But from there it’s mostly good. The driver seat has a (rather tedious) lumbar-adjustment knob, there’s a decent amount of interior storage space that includes a large forward console bin offering Qi wireless charging under Aux/USB/12-volt plugs, and easy-to-use audio and climate controls. Visibility is only fair to the front but better to the sides and rear corners, the latter aided by fold-down rear headrests and a rearview camera. Left to right: Move the front seats far back — and taller folks will need to — and rear legroom virtually disappears. The bed includes a handy (but not lockable) side bin and 110-volt power outlet. For the most part, the bed is just a bed. However, it did include a small but handy side storage bin (without lock, unfortunately) and a 110-volt outlet switched on and off with a dashboard button. And there was also a power-sliding back window that allows for long items to be carried, a nice touch. 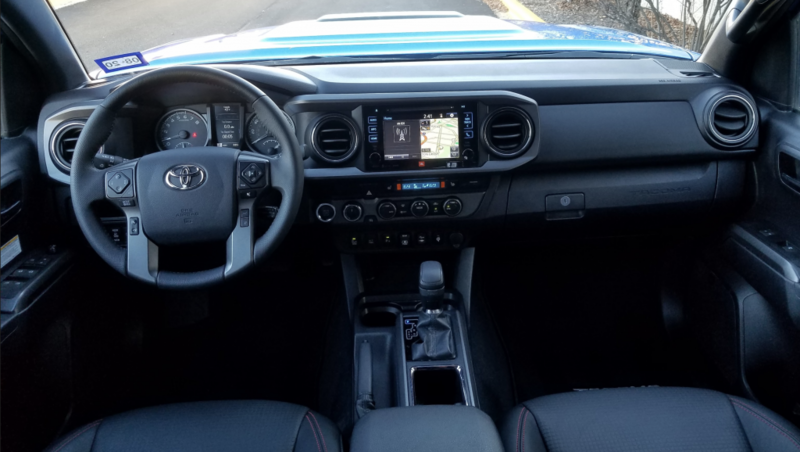 Our test Tacoma was powered by a 278-horsepower 3.5-liter V6 and 6-speed automatic, a combination that provided fine all-around performance and what Toyota says is up to 6800-lb towing capacity. And though I only averaged 19.0 mpg in mostly highway driving, that’s not bad for an off-road-ready 4×4 crew cab pickup. 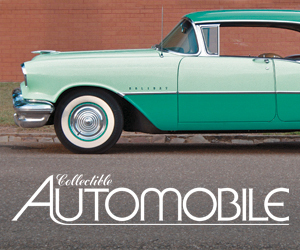 The only downside is that the engine can almost always be heard — even under cruise conditions — as it roars during acceleration and moans in the background at highway speeds. The tires add to the noise levels even driving around town, though that’s likely a sacrifice to the TRD Pro’s off-road capabilities. Of less sacrifice to that end was the suspension, which was surprisingly forgiving over our rough Chicagoland streets. However, maneuverability is hampered by rather slow steering, and the high fenders block your view of cars bookending the parking space you’ve chosen. While certainly a fine compact pickup, there’s nothing that really stands out about the Tacoma besides its commendable list of standard safety features. But it also gains points for its known name and Toyota pedigree, both of which probably pay you back at resale time … as might the choice of that magnetic VooDoo Blue paint. 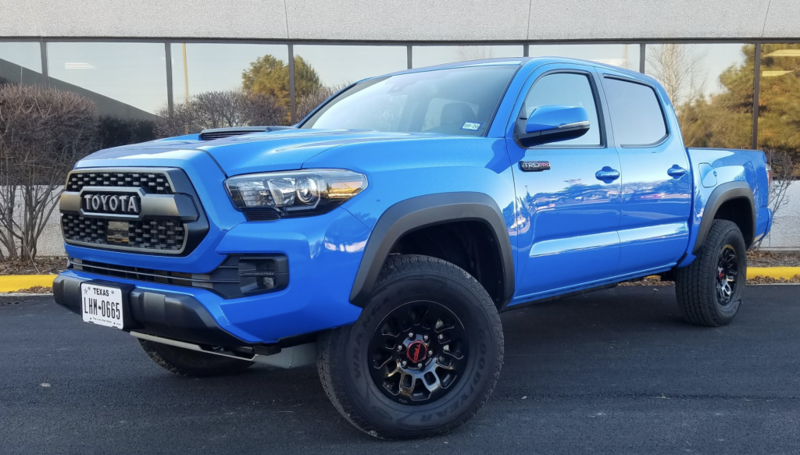 Even if you don’t really need the TRD Pro’s off-road capabilities and are just buying it for its macho looks, it really doesn’t penalize you on the pavement — save for the fact that shorter folks may need a boost to get in. Written by: The Daily Drive staff on January 17, 2019.on February 1, 2019.